BANGKOK (AP) — Palu, the Indonesian city devastated by an earthquake, tsunamis and mudslides, has strived to transform itself into a major trading hub, but the city’s buildings and other infrastructure were no match for the triple whammy that has left more than 1,200 people dead. The disasters that struck late Friday left the city’s port in ruins, its lone gantry crane atilt in the water. Its airport terminal was a sea of shattered glass and broken ceiling panels. A seven-story, 4-year-old hotel lay flat on its side. Its biggest bridge disintegrated, its picturesque yellow arches mangled in the mud. Ringed by coconut, coffee and cocoa farms, over the past two decades Palu has acquired modern shopping malls, hotels and other amenities to suit its ambitions. Poverty has fallen from nearly a third of its 380,000 residents to under one in 10, local officials say. A national blueprint calls for developing Palu as part of the “Sulawesi Economic Corridors” — a plan to attract investment and build up trade and commerce in a region that has remained somewhat isolated since the days of the ancient spice trade. Given how seismically active the area is — the Palu-Koro fault runs right through the city — it’s been a race against the odds. Historical records show the area has been hit by tsunamis — triggered by powerfully destructive earthquakes — at least seven times in the past two centuries. It’s unclear what standards were required, or enforced, in the construction of Palu’s modern buildings. It’s an issue for all of Indonesia, an archipelago that sits square on the Pacific Ring of Fire. Teddy Boen, an expert on earthquake-resistant engineering who has consulted with foreign governments and international organizations, has been researching the problem for a half-century. The collapse of a mezzanine floor inside the Jakarta Stock Exchange in January that injured dozens of people underscores the extent of the problem, even in Indonesia’s capital. After a tsunami in 2004 killed 230,000 people in Indonesia and elsewhere across Asia, it became apparent that in many communities, sturdy mosques and other strong buildings dating back to colonial times were the only structures still standing while newer structures often crumbled. In Palu, the Arkam Babu Rahman “floating mosque” on the city’s waterfront was pushed off-kilter by Friday’s tsunamis, while its worship halls remained intact. But a bigger, 20-year-old structure topped by a heavy dome was gutted as the debris-laden water swept through. 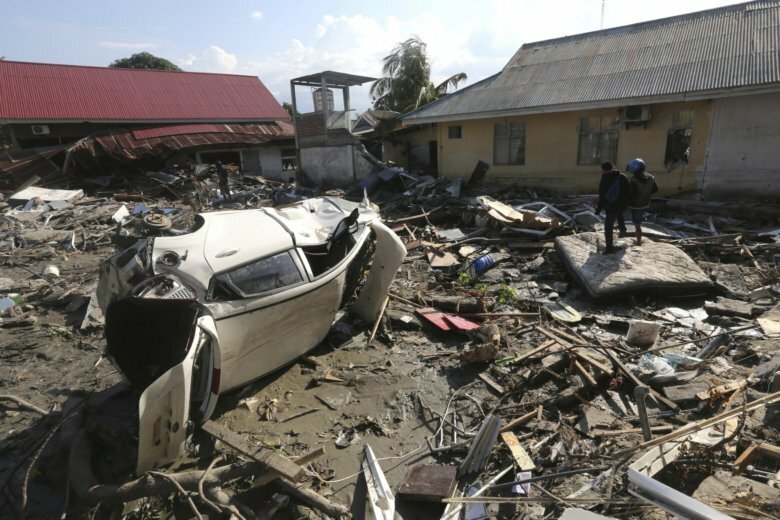 Few of the buildings in Palu’s suburbs of Petobo, Biromaru and Bala Roa could withstand the sideways mudslide that engulfed those communities in expanses of oozing quicksand. Indonesia’s disaster agency spokesman Sutopo Purwo Nugroho said the soil there had liquefied and that authorities believed hundreds of people may have been buried in the mud. In Bala Roa, the ground violently heaved up and then sank in places, trapping many people under their wrecked homes. Traditional homes with thatched or tin roofs cannot withstand tsunamis or storm surges from typhoons but pose much less of a risk of severe damage even if they do collapse in an earthquake. Many homes built recently are hybrids, combining traditional styles with unreinforced masonry and tile roofs too heavy for the structures when they are shaken by quakes. The rush to rebuild after a disaster involves cutting corners, rather than fortifying buildings to prevent future calamities. Elaine Kurtenbach is the Asian business editor for The Associated Press and has covered disasters and their aftermaths in Asia for the past 30 years.